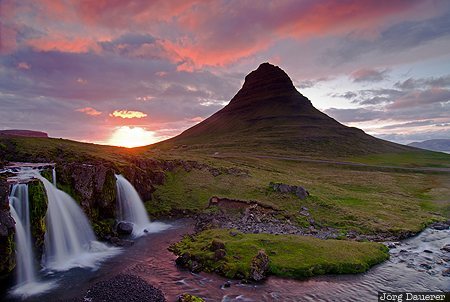 The waterfall Kirkjufellsfoss on the Snæfellsnes Peninsula with the iconic mountain Kirkjufell in the background below a colourful sky created by the setting midnight sun. Kirkjufellsfoss is in Vesturland in the west of Iceland. This photo was taken at midnight on a cloudy day in June of 2012. This photo was the image of the month in November of 2014. This photo is in the Photo Calendar "Iceland". This photo was taken with a digital camera.